I was going to give you something from my sunrise shoot at Shaw’s Cove last week but I started digging through the archives on my backup drive last night and found a lost set of photos from Balboa Pier that I never got around to editing. I haven’t shared a pier shot in awhile and I really love the way this photo turned out. While sitting at my desk processing this photo, I kept wondering why I can’t have this view from my cubicle at work. Some day, this will be my office. Capturing motion is a specialty of mine I love taking advantage of when I’m at the beach. When you’re photographing seascapes, a tenth of a second can make all the difference in the world, from capturing a little too much motion or not enough motion at all. 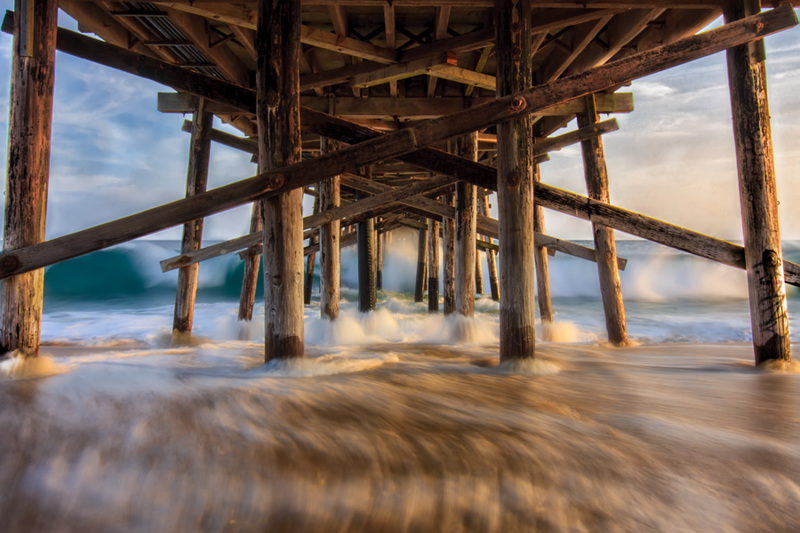 While standing underneath the Balboa Pier, I left my shutter open for .4 seconds, which was exactly the right amount of time to capture the motion of the water receding back to the ocean while another wave formed its barrel just before breaking against the shore. You can bet I certainly didn’t return to the car dry for this photo, but that’s all part of the joy in shooting seascapes. I love being able to stand barefoot in the ocean, feeling the wet sand between my toes and the water rush past my knees. It is one of the greatest feelings in the world.